An evening spent wandering on the internet. I like wandering on the internet, it’s kind of like daydreaming in a way. But unlike daydreaming, you can trace your thought process back to where you started. People always comment on the amount of tabs I have open in my Chrome browser. I like keeping lots of tabs open when I’m researching something or you know, just casually wandering the web. Since discovering Murally I generally do it less, but sometimes even copying links into murally can break the flow. So a thousand tabs sit at the top of my browser like a breadcrumb trail of the journey I’ve just been on. In my mind is the word Volvox. I’ve never heard or seen it before tonight. 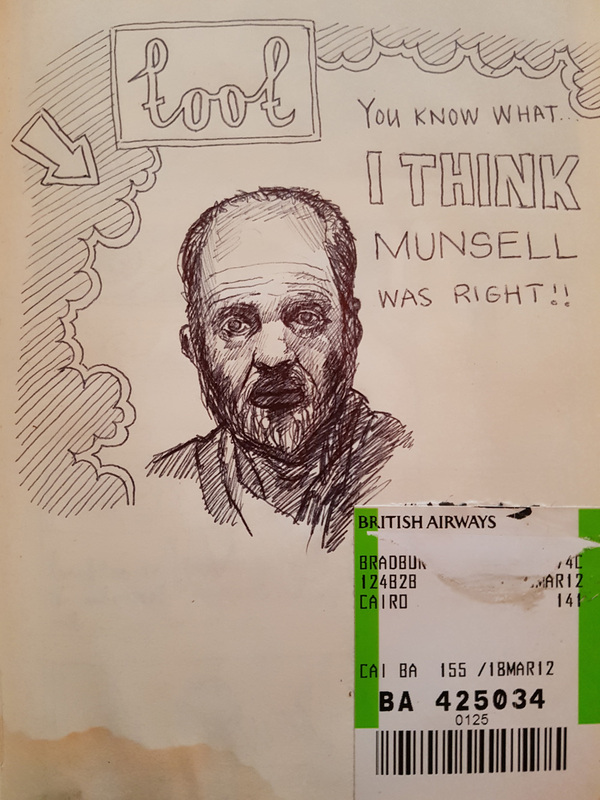 Looking through an old sketchbook I find a baggage ticket from my trip to Cairo in 2012 stuck to a page with a biro sketch of a mans face and the words “You know what… I think Munsell was right! !” I’m not sure what he was right about, but I do know I want to look at some Munsell colour system pictures. … To the internet. Starting with Munsell color system. 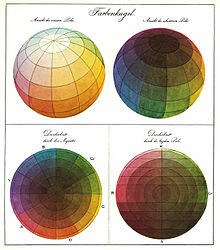 I’m looking at the munsell colour system again. I love the three dimensional colour structure it creates. Jumping to google images I save a bunch of images to a journal folder. I take a Munsell test where you have to order colours in order of hue. I get a perfect score which makes me feel really good. I look for more. I find another. I ace it. I feel like a colour ninja. So back to the Munsell wikipedia page. Scrolling down the page I see Runges farbenkugel – I like the name. Farben is colour in German and Kugel is sphere. Continuing the journey I look at the cylindrical coordinate system. It makes me think of the the different types of mapping I’ve worked with and in particular spherical panoramic raytracing. I wonder what the German for cylinder is. It’s ‘zylinder’, which I don’t really like the sound of. I’m reminded of the time I made Loetzinn and realised the title should really be Zinn Soldat due to a mistranslation of Tin Soldier with Tin Solder. The preference was for the mistranslated word because I didn’t like the Z at the beginning. Sounds of words is important. Vortex, V.02, Vessel… I must like V’s. So as I expand the google translate widget and see the word ‘Walze’, which I do like. A roller, drum, cylinder… These are all things that interest me. I wonder if the word waltz comes from this. Off to my usual haunt, Etymology Online. So waltz comes from the German word walzer ‘to turn or roll’, from Proto-Germanic *walt- (cognate with Old Norse velta), from PIE root*wel- (3) “to turn, revolve” (see volvox). Ooooh, volvox. Volvox is a type of green algae that forms spherical colonies. Spherical colonies that are made of individual cells that work together… In a sphere. So vol is generally related to rolling, this is where volume comes from regarding books. A roll of parchment would be called a volume because it was rolled up. Vox means voice but as far as my research is bothered to go it doesn’t seem that this is part of the etymology of volvox. Maybe Volv is from the Latin volvere and ox is something to do with the animal or the ox part of oxygen which is from a Greek word for acid. And so the journey ends.